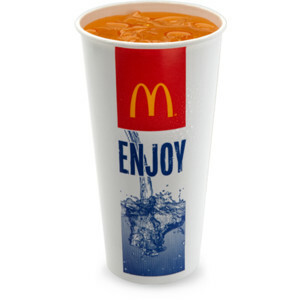 McDonald’s Replacing Hi-C Orange Lavaburst Drink from all locations. Beginning in the 90’s this drink was the most popular flavor. Beginning this year they will be introducing a new drink in the soda fountain called Sprite TropicBerry that will be served exclusively at McDonald’s locations. It’s part of the company’s partnership with Coca-Cola. Ingredients: Water, High Fructose Corn Syrup, Citric Acid, Ascorbic Acid (Vitamin C), Potassium Benzoate (To Protect Taste), Modified Food Starch, Natural Flavors, Glycerol Ester of Wood Rosin, Yellow 6, Sucrose Acetate Isobutyrate, Red 40. Many people are truly disappointed about the discontinuation of the Hi-C drink. But I am sure that people will be surprised by the Sprite TropicBerry. Its good to try new things. Do you remember other food or drink choices there were at McDonald’s and are no longer? Chicken Selects – Sales did not keep up and were discontinued in 2013. Supersize Option – Was not a good idea as they wanted to promote a healthier menu. Angus Burgers – They thought this item would be a high end item on the menu but sales were down. These burgers were discontinued in 2013. Big & Tasty – Tried to be like the Whopper at Burger King. Off the menu in 2011.